Across the country today, people are celebrating Giving Tuesday. It’s always a great excuse to update you on two Southborough girls who continue to embody the spirit of the day. It also gives you a chance to double your “giving”. You can buy gifts for people you care about while funding gifts for sick children. In 2015, Lauren Dratch and Caroline Sullivan successfully launched “Pretzels for Presents”. The Southborough middle schoolers sold gourmet pretzels to raise money for a worthy cause. Proceeds were used to buy presents for patients who are stuck in the hospital through the holidays. The children receiving care there are mainly burn victims and children with cleft lips and palates, and they come from all around the world. The people at Shriners work hard to make the hospital feel like a home away from home for them, and the best part is they are able to treat these kids without charge. Last year, they raised $1,500, mostly from the Southborough community. 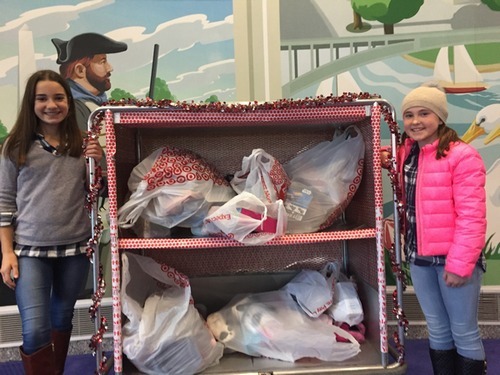 As a result, they were able to deliver an overflowing sleigh full of gifts to the children receiving care. Orders must be emailed by Monday, December 10th. Purchases will be delivered the week of December 17th-22nd. To purchase pretzels or donate directly to their cause, email Caroline Sullivan at carolinesullivan@stmarksschool.org or Lauren Dratch at laurendratch@gmail.com. For more details, click here to read their flyer.